As far as we know the now familiar tune to which we sing "Amazing Grace" first appeared in two variants (ST. MARY'S and GALLAHER) in the American tunebook Columbian Harmony published by Shaw & Spilman, 1829. Two variants in other tunebooks were LOVING LAMB and HARMONY GROVE. This tune no doubt existed before for that time in oral tradition and perhaps as a Scottish folk song. 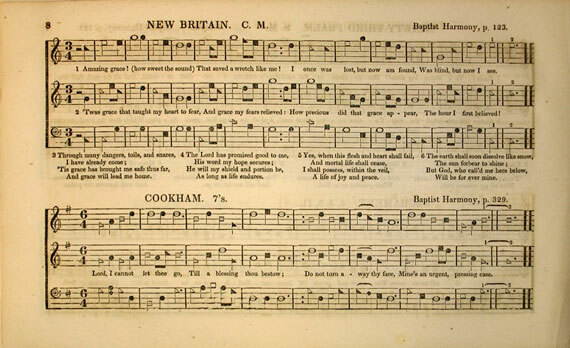 The first wedding in print of this tune and the hymn "Amazing Grace" appeared in William Walker's famous shape-note singing-school tunebook Southern Harmony, 1835 where it was called NEW BRITAIN. The image seen here is from Southern Harmony, 1847. The melody is in the middle part.